A hotel in Peterborough is one of a group of five that have just been put on the market. The 70-room Dragonfly Hotel, in Thorpe Meadows, has gone up for sale as part of an RBS bank led disposal of the portfolio of the Dragonfly Hotel group. Five hotels across East Anglia have been placed on the market with a total price tag of £13.75 million. The RBS has appointed Colliers International’s hotel agency team to dispose of the Dragonfly Hotel portfolio. 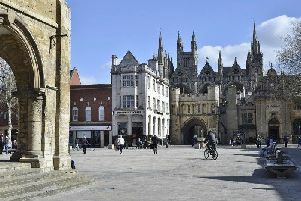 The package is made up of hotels from Bury St Edmunds through to Peterborough. They are the 71-room Dragonfly Hotel in Symonds Road, Bury St Edmunds, which is being sold for £3 million; the 70-room Peterborough hotel in Thorpe Meadows, which has a price tag of £3 million; the 50-room Dragonfly Hotel in Beveridge Way, Hardwick Narrow, King’s Lynn, which has a sale price of £1.85 million; a 50-room hotel at the A12/A120 Ardleigh Junction, in Colchester, for £1.95 million and the 76-room hotel in High Street, Stevenage, with an asking price of £3.95 million. In total the hotels account for 317 rooms. Paul Barrasford, Colliers International hotel agency director, said: “This is a fantastic opportunity to acquire an established hotel portfolio which offers prospective purchasers the opportunity to invest and reposition the businesses. “These properties are also ideal for an individual investor or private individual with a vocation for the hospitality sector. Offers of a full portfolio sale will be considered in addition to interest on a sub-group and individual basis.